I once met a man who had been a police officer. His law enforcement career ended one rainy night on the side of an interstate highway in Connecticut after he pulled over a drunk driver. Despite having the lights of his squad car on and following the rest of the safety protocols, he was hit by another drunk driver, thrown 40 feet onto the roadside. He had chronic pain and many sleepless nights after the accident. The irony of him suffering from the kind of tragedy he was trying to prevent was not lost upon him. My mom was widowed at 42. She had worries, despair, and loss. Our next-door neighbor also went through similar experiences after she was widowed. All three of these people were comforted by praying the rosary, Catholic prayer beads. The practice helps one see their personal struggles as a “cross.” Seeing problems in such a light helps keep perspective on the various challenges that face everyone. If you’re open to the idea, it makes absolute sense to include prayer beads in your sleep skill toolbox if you’re regularly having trouble falling asleep. You, too, have problems of your own. You, too, have your own thoughts. One thought after another keeps the mind whirling. The practice, as part of a sleep routine, can help stop the cycle. Praying with prayer beads isn’t just for Catholics. Some Protestants have their own way and techniques of doing it too. Some involve petitioning the Virgin Mary, some don’t. No matter what group you identify with there’s a take on the idea for you. It’s common throughout many belief systems. Muslims, Hindus, and Buddhists also use prayer beads as a tool for reflection. There are different methods, too many to go into here. There are even prayer beads to help atheists contemplate life. Covering the various techniques and styles are beyond the scope of this article. Insomnia, unfortunately, strikes everyone. Repetition is the key. 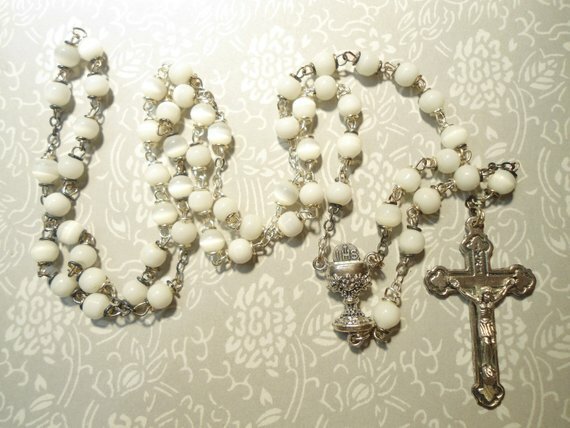 For many Catholics, the good thing about praying the rosary, which focuses on pondering different events in Jesus’s short life, is that it provides a way of mentally and emotionally dealing with your problems. Some other solutions like counting sheep and doing math problems in your head don’t though they can put your mind on other things which helps combat a runaway mind. Long term, however, the problem with those methods is that counting sheep and doing math problems aren’t “meaty” enough. There’s not enough to consider. The sorrowful mysteries, which highlight episodes of struggle in Jesus’s life, are prayed on Tuesday and Saturday. The joyful mysteries, which focus on happy times in Jesus’s life, are prayed on Mondays and Saturday. The luminous mysteries are prayed on Thursday. The glorious mysteries are prayed on Wednesday and Sundays. Life isn’t all misery and suffering. Neither is it one happy moment after another. Contemplating events in this way allows a sense of balance. However, like with keeping a dream journal, it’s preferable to go low tech when it comes to prayer beads. Screens are too disruptive around bedtime. Still, there are apps available for smartphones that help one track and count the meditations and prayers and the convenience of those apps is undeniable. Under certain circumstances, they can be a help. It’s also preferable to manipulate the bead tangibly rather than depress one part or another of a device’s screen. The screen requires a certain touch that the physical device doesn’t. For many people, this form of active form of meditation is preferable to clearing the mind and trying to focus on keeping it blank. They’re doing something. They’re applying energy. The rosary, or prayer beads, are tools to guide thoughts. The mind can cycle endlessly over the same few thoughts again and again. This more active form of meditation would work better to defeat the mental churning. After a certain point, mental rumination does no good. The things that keep us awake at night touch on matters of religion and faith at times. It’s impossible to separate them. Trying to forgive or a lack of forgiveness is something that keeps people up from time. Trying to affect matters beyond their control is another. Faith of some kind is a potent antidote to the anxiety that can keep one up at night. Long term, a meditation method like this can be more effective than any sleeping pill. Memorizing the process of the meditation is less disruptive than relying on a recording or book. Some kind of repetitive, active meditation should be considered a powerful sleep skill for your bedtime toolbox. How to pray the rosary.